The Only Song I Need in '09: Animal Collective's "Summertime Clothes"
It might only be two weeks into '09 but I think I've already got a soundtrack. The world of music journalism is on board with the new Animal Collective album, Merriweather Post Pavilion, and rightly so; it’s a varied, dense and accessible piece of weird-pop wonder. On it, there is one song in particular that I need to listen to five to 10 times a day because it makes me feel that good. I speak, of course, of “Summertime Clothes”. The song begins with some odd, pulsing, syncopating keys, then thumping bass joins in to smooth out the pulsations, making it a head-nodder by the 20-second mark. The song progresses nicely; when the layers of vocals begin the song gains some momentum and depth without taking any drastic steps. Then the vocal harmony starts and brings the song into Brian Wilson territory (or perhaps, more aptly, the excellent Brian Wilson aping of 2007’s Panda Bear album), and once the vocal inflection hits on the “makes me smile” line we know we’re in the land of Pop Monster-Jams. The chorus hits almost without warning sending a rush of emotion that makes me want to throw my arms in the in time to the “dusty but digital” electro-lushness. By the time “I want to walk around with you / And I want to walk around with you” (is that a direct refutation of the Ramones?) comes in, it’s a bit disappointing that the chorus has already ended, but there’s still the exciting anticipation of its return. This song manages to hit a perfect balance of pure pop bliss mixed with wonky and interesting electro instrumentation, and it even maintains a few weirder, more classic Animal Collective bits, like the ending repetition of “just you” and the midway slow down that immediately joins the pulsing syncopation. 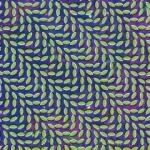 Though there’s the slight disappointment that the Animal Collective are all but done with the psych experimentation they began with, the fact that they’ve started making pure pop while maintaining the layered, sometimes confusing, electro-psych aspects, is promising. And if they can make more hits like “Summertime Clothes” I don’t know if I’ll ever listen to another band. That’s right: It’s that good.